ATCHISON — Many men are passionate about their hobbies. But rarely is all that enthusiasm devoted to vegetables. Here it is, a Tuesday morning, however, and Mark Jirak has just gotten out of daily Mass with his family at St. Benedict Church in Atchison. 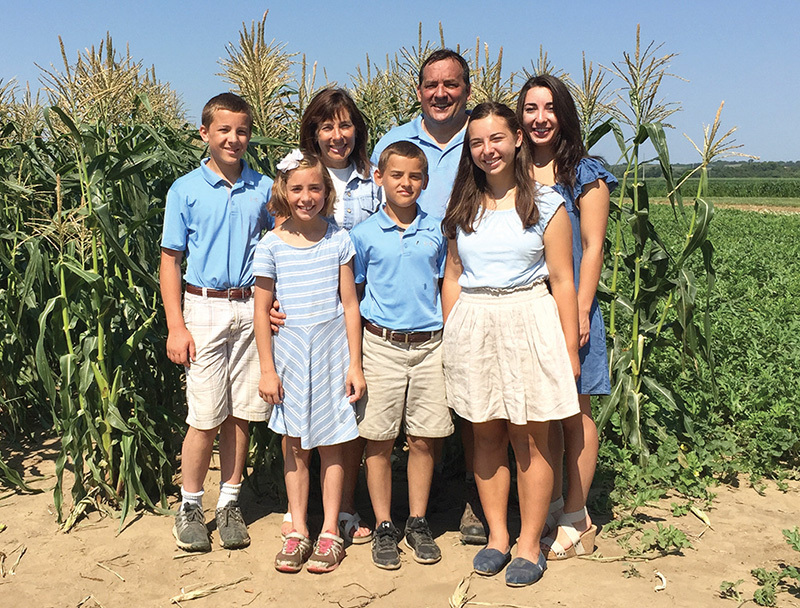 You can hear the pride in his voice as he and his wife Theresa, with five of their six kids trailing behind, walk the countless rows of crops he grows on his farm just north of Atchison. Mark is employed full time by Syngenta as the commercial unit manager for vegetables in eastern North America. But he bought the farm more than 14 years ago in pursuit of his hobby. He’s just that passionate about vegetables. The Jirak Family Produce Farm specializes in growing sweet corn, watermelon, cantaloupe, cucumbers, squash, green beans, pumpkins and more. They sell the majority of their crops to local school districts, restaurants and farmers’ markets and donate excess produce to local food banks. Growing up on farms themselves, Mark and Theresa saw the value this lifestyle could provide for their family. In addition to learning to farm, Mark and Theresa’s kids have also learned communication and financial skills while working at the local markets. The farm has also been a way for the Jiraks to come together as a family and learn lessons that go beyond a classroom. The family has connected their farm with their faith by finding correlations to different events in the Bible — especially, they say, Jesus’ agony in the garden. The farming life is very demanding, said Theresa. “You feel grateful when you do have a good crop because you know it’s not all you — it’s God shining down,” Mark said. The connection to their faith really became apparent two years ago when they got news that would change everything. Mark had been diagnosed with cancer. “All the kids learned to really pitch in together during that time,” she said. Mark has now been in remission for almost two years and is back to looking toward the future of the family farm. The Jiraks recently expanded their business with farm in Cummings. Mark said he looks forward to the day he can retire so he can concentrate full time on two of his biggest passions. Vegetables, of course — and the Kansas City Royals.